It is important to dream big; pursuing dreams gives life purpose and meaning. We all have aspirations, and we set our goals accordingly. The internet has brought the whole world into our homes and is offering us new ways to earn money. So many possibilities and opportunities. Nowadays it's easy to create a website from nothing, and some of the best online publishing platforms such as WordPress, Blogger and Weebly are free. No need to spend money when you are starting out and want to test the water. Of course, once you start to research on how to get your online business off the ground, you regularly come across websites that want to show you how you can earn a staggering six figure income and get rich in a flash. And their stories is always the same: how they were broke, when they suddenly had an epiphany and turned their last 10 cents into a vast fortune. Whether you check out their free advice or pay a fee for their products and services, trust me, none of them hold a magic wand elevating you from rags to riches. It is you, who has to do all the hard work. Don't get me wrong: I'm not saying it's all a scam; I've come across some very valuable advice that has helped me immensely building my business, but do take any claims that an e-book or e-course will help you earn big money online with a pinch of salt. Also, you don't need to sign up to all of them! The sales pitches approach you from different angles, but in the end they all have similar advice. Target a specific audience. Offer something unique. Don't imitate the competition. Be yourself. Share useful content such as helping your readers solve a specific problem. Plan and lay out your website accordingly. Your regular presence on your website is vital to connect with and build your audience. Update your blog and social media accounts on a regular basis. It takes time to build trust and loyal readers; be patient and keep going. Success doesn't happen overnight, and when it does, it usually disappears as quickly. Give your customers what they want and what they need; do your research. Offer products at different pricing levels, so everyone can afford something. Your website content is your marketing material. Offer the best you can for free to turn visitors into paying customers. 1. What do I need to know about my ideal niche? 2. What do I need to focus on to show commitment? 3. How can I improve on my portfolio? Remember, a six-figure income is rarely achievable, but it is certainly possible to make a living doing what you love, if you follow the above tips and do your groundwork. Once you have laid these foundations, you can take your business to the next level: generate new ideas, innovate, diversify, build and nurture your tribe...evolve. Yep, common sense, but a good reminder. Ran your spread on a question I have about a non-Tarot biz thing I'm thinking about. 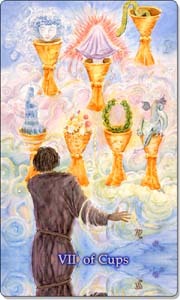 Five of Swords?-Eight of Wands-Seven of Swords Reversed. Hmmm. May need to rethink that whole thing and maybe get the Tarot biz established first. Thanks! If it weren't for Tarot, I think I'd be scattered in a thousand different directions. Great advice. The internet can overwhelm you with info, but Leonie Dawson's Academy is an excellent resource, and there are other online circles which can help you grow without costing a fortune. Yes, Leonie's Academy is a great resource, but sadly it is getting more and more expensive each year, and I fear that soon it will be out of reach for a lot of people. Nevertheless, I enjoy being a member, and it has helped me a lot.